Laurie had just completed her last treatment for breast cancer. That was on Thursday. Our rejoicing was cut short, by making immediate plans to go to South Carolina to be with Mandy and her kids. We didn’t expect Zac to be alive by the time we arrived. As memory serves, it seems that from about Wednesday on, he was ready to go and seemed to be on his way to see Jesus. We arrived Saturday night . . . me; my wife, Laurie; my sister, Barbara; and Zac’s sister, Stacey. I remember arriving late and needing food. I’d say it’s a Smith-thing, but really, we all gotta eat. The only thing, or at least the first thing we found, was a Waffle House. This would be a new experience. Sunday morning, Stacey left our hotel and went right over to the house to say good-bye to her brother. It wasn’t long after that we were invited to stop by as well. I remember the mixed emotions of going to say goodbye to a young man that I loved dearly, my nephew, and a real good friend. After a time, and some prayer, the family made their way to church while I stayed back with Mandy in case she needed any help. After church, my brother, Jim, took the whole gang out to find some lunch while Mandy and Sharon remained close by. After lunch as we were driving back, the cell phone rang. Being there to say good-bye to Zac was a special moment. Knowing Zac was much more rewarding. I, along with those that knew him, had no doubts as to his faith in Jesus. As sure as I’m sitting here right at this moment, I knew what happened to Zac one year ago on that Sunday afternoon. Everyone that knew him loved him and would miss him greatly. And we still do. In God’s sovereign care of Zac and Mandy, He moved them to Anderson, South Carolina where Mandy remains today and where Zac was given an amazing platform to share his story and where we all watched as God would use a couple of videos to tell countless numbers of his confidence in God’s goodness and His glory. Tomorrow, is the one year anniversary of the day Zac went to be with Jesus. It was the 16th, which this year falls on Monday. Just a couple of nights ago, Laurie and I were reminded that she has been cancer-free for a year. We remember and we rejoice. We rejoice in God’s grace, His kindness, His plans, His mercy, the life He gives us, the days that He has already numbered for each of us. We rejoice that He’s God and He’s got this. He’s got us. This weekend I’ll think of Zac a lot more. And I’ll think of his sweet wife and three pretty cool kids. I’ll pray for them and for his mom and dad and his sister. 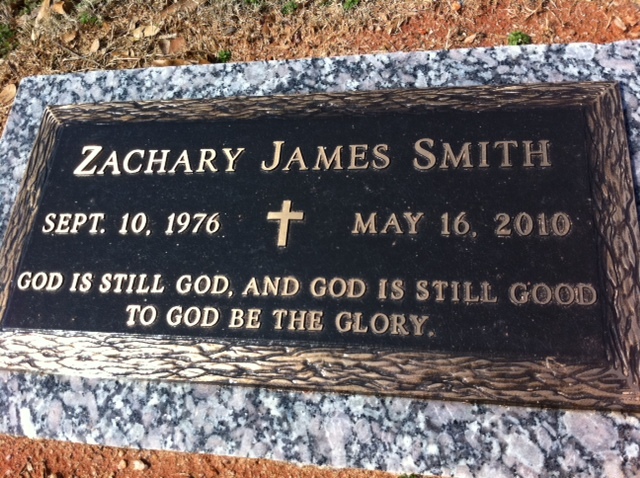 And I’ll think of Zac’s message that is just as true a year later: God is still God, and God is still good. To God be the glory. Death for the believer is a whole different ball game. Sunday I shared from Paul’s prayer in Ephesians 1:15-23 that we are the inheritance of Christ. We’re His. We belong to Him. And also, Paul prayed that as we realize what we already have because of Christ, that we’d realize the hope we have because He called us. Because we are saved, we now have a hope. That hope is to see Jesus. That hope is to have eternal life with God. That hope has now been realized for Karen. There’s a lot about death we don’t like. I get that. But as followers of Jesus and worshipers of the Most High God, we have a hope that death gets us there. Hope isn’t wishful thinking. Hope is factual assurance based on the character of God and on His loving, gracious history. We trust Him because He can be trusted. We have hope because it is in Him. Let’s keep our eye on the prize. Let’s keep our focus on Jesus no matter what curve balls have been tossed your way lately. He’s got you. And yes, He too is looking forward to the day when we all get to be together. My nephew Zachary James Smith, died today @ 3:05 pm. One year ago, the day before Mother’s Day, he learned he had stage 4 colon cancer. I have a feeling I’ll have a few things to say about Zac over the next few days and weeks. A couple of weeks ago he called and asked my to give the eulogy at his funeral. But tonight I simply want to say, a very dear friend of mine died. He left this world and joined Jesus in the next. Tonight I went to the NewSpring service alone. Most of the family went this morning while I stayed behind with Zac and Mandy. I loved every minute of my day. As we arrived at his house, I couldn’t believe I had the chance to speak with him one more time. More on that later, maybe. As I walked into NewSpring, I suddenly realized how surreal this was going to be. To be at Zac’s church, without Zac. There’s really no reason I would ever be in Anderson, South Carolina, or NewSpring Church, or know a handful of amazing people who I now know because of Zac. I sat in the back and wept through most of the service. This one time, I kinda liked the idea of being alone. The music, the memories of walking around the campus and the auditorium with Zac. This is only my 3rd visit to this place, but I’ve felt a sweet connection with this part of Zac’s life. I really wanted to walk upstairs to his office and see his coworkers and say hi. I wanted to walk to where his desk was. But I didn’t. I’m grateful for the memories of Zac throughout that place of worship and work. I’m grateful for the many people that made that a special place for Zac. My thoughts are many tonight. But for now, let me just say, Zac was not just a nephew that I loved, he was a friend. A really good friend. I already miss my friend. Last Sunday I preached on the cross and my points each started with; “Because Jesus died on the cross…” I’m not done with my sermon for Sunday, it may or may not have that familiar sound to it, but I’m liking it. So, what is different in your life ‘because Jesus rose from the dead’? I’m thinking that’s huge. Go ahead, think about it and I’d love to read your comments below. Here’s some news. This morning I was told that Duane and Becky Witt’s daughter was on CNN. Here’s the link if you want to check it out. I know her as Vanessa, but her name is now Giada! Pretty cool. This is a great reminder to pray for her and many others that are serving in our military operations around the world. As you pray this week, please pray for Mary Olson and her sweet family. Mary learned yesterday that cancer has spread in her body, particularly to her bones. This is hard news, but they are confident of God’s love and care for Mary, as am I. They are pursuing answers so they can make good decisions. I noticed today Zac has a new blog update. You can click on it on the top right side of this page. Today I’ll be watching online church at NewSpring. This is where Zac works. Today at 4 AZ time, you can watch the service online where they will show a video of Zac. I can’t say much about it yet, because I’ve not seen it either. But, I’d encourage you to go check it out. Let’s see what God is up to. Two more DCIS were found in the lumpectomy tissue and some microinvasive cells with hormone receptors were found in the two sentinel nodes that were removed. (FYI: DCIS is a tumor that eventually turns into invasive cancer; microinvasive tumors are microscopic and ten years ago would not have been discovered at this stage.) The next step is to meet with the oncologists and form a plan of attack. At this point it looks like it will probably include radiation (localized) , as well as some chemo (systemic), but the details will be clarified after the oncologist appointments. Thanks to each of you for your prayers and encouragement. Laurie knows she’s loved and that so many dear friends are praying for her. Thanks. My wife had a lumpectomy and sentinel node biopsy today. She’s home now and we’re thankful for good docs. Because her previous surgery was less than a month ago, she’s a little tender and sore. Her mom joined us yesterday for the week. We’re so blessed and thankful for great family and a gracious church family. Thanks to all for support and prayers. We expect to know sometime on Tuesday if any more cancer was found. For now, we’re just thankful. Great to have her mom around. I’ll update as we learn more. Thanks. Good news: The doctor said, “that’s about the smallest cancer I’ve ever seen”. Bad news: That little piece of cancer is inside my wife. Laurie and I had a visit with an oncologist this past Friday. He is very optimistic based on the size and location of the cancer. Laurie will have one more surgery to see if there has been any spreading. Then she’ll probably proceed with a recommended radiation treatment. We too are hopeful and confident based on information we’ve received and based on our trust in God and His great love for us. That great love does not translate into a trouble-free life or an instant on-the-spot healing. It’s based on God and His goodness. He is good. Whether in life or death, health or sickness. We’re on a new journey, and we’re as ready as we know to be. We continue to thank God for allowing this to be seen so early. While visiting here in Anderson, I went with Zac and Mandy to the Dr’s office where they learned the results from the latest tests. Join me in praying for Zac and his family as he decides the best action to take at this point. I’m glad to be here for this part of the journey.